Rising stars Rachel Spencer and Duncan Strachan are making a name for themselves as two of the most sought-after young instrumentalists in the UK, and they are no strangers to working together in a vast array of mediums. The couple met whilst students at the Royal Conservatoire of Scotland, and quickly came to prominence after winning all the major solo and chamber music prizes there, and they were subsequently selected for the newly-established Young Artist in Residence scheme. They have since gone on to perform across the country as well as internationally, including concert tours to Denmark, India and the Middle East, and are Live Music Now Artists, a position which sees them performing an enormous range of musical styles to audiences including schoolchildren, those in residential care and in hospitals. At every level and in every context they have consistently delighted audiences with their strong ability to communicate, and to give enthralling, virtuosic and intimate performances. 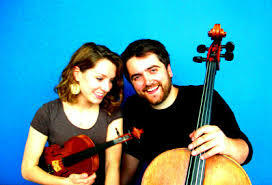 Rachel and Duncan also form two thirds of the Kapten Trio with dear friend, the Estonian pianist Kristi Kapten. Unlike no other string duo, Rachel and Duncan double as a soprano/piano duo, performing a wide range of the song repertoire. The combination of these skills makes for extremely diverse and interesting recitals, which have been described as “exceptional… so much to treasure and to think about” by recent audiences. Rachel Spencer studied violin with Peter Lissauer and James Clark at the Royal Conservatoire of Scotland and later with Alexander Janiczek at the Guildhall School of Music and Drama. Her singing teachers have included Edward Caswell and Christopher Underwood. Praised for her “devastatingly beautiful playing” (The Herald), Rachel performs widely across the UK as a soloist and chamber musician. As a singer, Rachel has appeared as soloist on such stages as the Royal Albert Hall, on broadcasts for BBC Radio 3 In Tune and BBC Radio London and on choral recordings for Decca and Delphian labels. Duncan Strachan studied at St Mary’s Music School, Oxford University and the Royal Conservatoire of Scotland. His cello teachers included Audrey Scott, Colin Carr and Robert Irvine, and his piano teachers included Audrey Innes and Christina Lawrie. In 2010, he formed the Maxwell Quartet with whom he also performs across the UK. He has appeared widely as a concerto and recital soloist to critical acclaim. In 2015 he takes up the position of artistic director at the Loch Shiel Spring Festival. This concert is supported with funding from Enterprise Music Scotland. We strive to create inspiring and carefully tailored programmes, which not only exhibit the great cornerstones of the duo repertoire such as Kodaly, Ravel and Schulhoff, but also delve into the lesser known, but equally fascinating, duo works of the Classical and Romantic eras, such as the remarkably virtuoso works of composer Alessandro Rolla. The experimental world of Schnittke and Scelsi offers audiences an insight into mid-twentieth century explorations of sound and colour. For something closer to home, Scottish music often forms an element of our programming, from arrangements of traditional melodies, to Eddie McGuire’s specially commissioned duo work, “Dance Suite for Two”. Our own unique arrangements of light classics, such as Massenet’s “Meditation from Thaïs”, Monti’s “Czardas”, and Dvorak’s “Humoresque”, are often a popular adjunct to the more standard repertoire. In addition, we perform in a second guise as a soprano and piano duo, equally at home performing songs by Purcell and Thomas Arne, the lieder of Mozart, Schubert and Wolf, through to the show songs of Gerschwin and Bernstein.